This MOD coordinates the value and the effect of food or crops as follows. 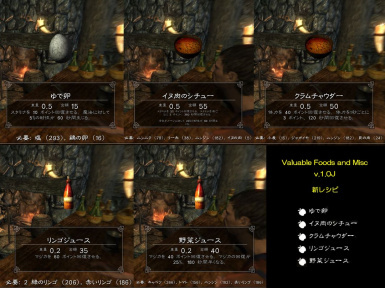 + The useful effect of all foods are strengthened to have the life that your player character does not depend on potions. + Five new recipes are added to cooking. + You can cook Baked Potatoes and Grilled Leeks. 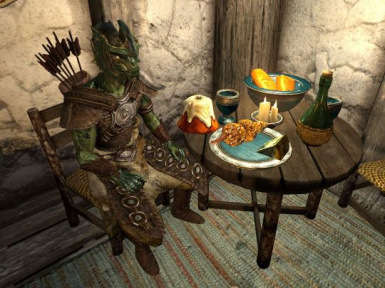 + The value of furs, meats, tusks and foods, the dishes go up it so that your player character has life by hunting and collection. + You can loot antler, tusk, eye by two at hunting. + You can also loot two Giant's Toes. + Chickens come to lay an egg. + Value of silverwares is raised. + The names of the items were changed clearly. Simply extract to the ..\Steam\steamapps\common\Skyrim\ folder. 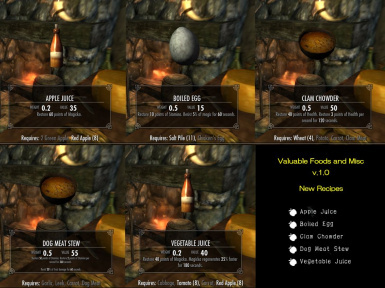 Then, enable "Valuable Foods and Misc.esp" in the Skyrim launcher.